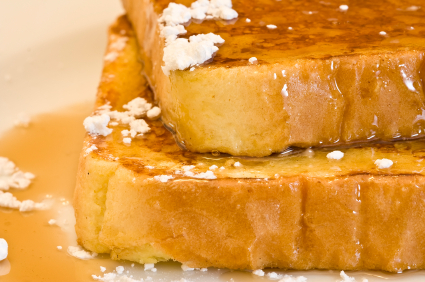 You are currently browsing the tag archive for the ‘french toast’ tag. A special thanks to our friends at Anchor Point Bed and Breakfast for this Vegan treat! An eggless french toast that absolutely delights our Vegan guests! Enjoy our weekly recipes sent right to your in-box! In a blender, puree the tofu, orange juice and sugar. Pour into a shallow dish and then dip each slice of bread in it on both sides. Melt a dab of soy margarine in a frying pan. Cook each side of each slice of bread in the frying pan until golden brown. Serve with vanilla soy yogurt, sprinkled with a pinch of nutmeg and garnished with a sprig of mint. TIP: Don’t soak the bread too long.